Sir Francis Galton was an English explorer, anthropologist, eugenicist, geographer and meteorologist. He is noted for his pioneering research on human intelligence and for introducing the statistical concepts of correlation and regression. He is often called the “father of eugenics”. 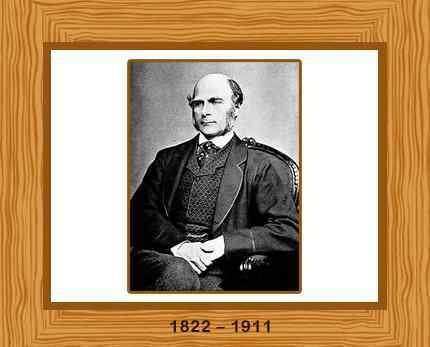 Francis Galton was born in Sparkbrook, Birmingham, England, on the 18th February 1822, the youngest of seven children. His father Samuel Tertius Galton was a successful businessman and his mother was Francis Anne Viollette Darwin. Interestingly, Francis’s maternal grandfather was physician Erasmus Darwin and the famous Charles Darwin was a also grandson of Erasmus, making Francis and Charles Darwin first cousins. As a child Francis attended several schools, spending two years at King Edward’s School in Birmingham from 1836. His parents wanted Francis to study medicine, so he then was apprenticed for a year to the General Hospital in Birmingham as a house pupil. Still in his teens, Galton took a medical tour of the continent with two young doctors. In 1839 Galton enrolled at King’s College London to study medicine. Galton appeared to have caught the travelling bug writing “a passion for travel seized me as if I had been a migratory bird.” and he toured the continent again with a friend visiting Constanza in Romania, Constantinople and the cities of Smyrna and Athens in Greece. In the Fall of 1840, Galton moved to Trinity College, Cambridge, to study medicine. He later switched to the mathematics course but fell ill in his third year and left with basic pass “poll” degree. The death of his father in 1844 left Galton financially wealthy and he realized that he could indulge in his own interests without financial worries. Galton travelled up the Nile to Khartoum with a group of friends and also visited the Holy Land and Syria. For five years from 1845 to 1850 he split his time between London and Scotland and took up a sporting life. In 1850, he began an expedition to south west Africa with the approval of the Royal Geographical Society. This was an area virtually unknown to Europeans at that time. His findings were published in his 1853 book “Tropical South Africa” and he was elected a fellow of the Royal Geographical Society the same year. On his return from Africa, on 1 August 1853, Galton married Louisa Jane Butler. During their marriage, the Galtons had no children. Galton made no further overseas expeditions, the trip to Africa having permanently affected his health. The publication of Charles Darwin’s “Origin of the species” in 1859 appears to have been influential on Galton who interests changed to hereditary around that time. Galton spent much his of the next thirty years of his life developing his theories on eugenics, which aimed to improve the physical and mental make-up of the human species by selected parenthood. He was a prolific writer, authoring over than 340 papers and books during his career. Galton published his book “Hereditary Genius” in 1869 in which he studied genius and greatness. He proposed encouraging talented young men and women to have children earlier on in life, thus improving the human race. Galton carried out several studies on the inheritance patterns in sweet peas, discovering if seed size was an inherited trait so that, for example, very large seeds produced very large plants. In his studies he devised the regression coefficient that became an everyday tool in statistical analysis. Measurement data was also gathered about families, such as height, weight, chest span, head size, arm strength, hearing, visual acuity, and colour sense. Galton prepared graphs of his data including two-way plots of heights of parents and the heights of their adult children. Through his analysis he discovered what was later called the measurement of correlation. He published “Natural Inheritance” in 1889 which heavily influenced Karl Pearson, a leading mathematician and biostatistician. In the 1890’s Galton established that fingerprints did not change as a person ages and confirmed that they could be used as a unique way of identifying a particular individual. He identified eight types of fingerprint patterns and a classification system that is still used to this day. He was the inventor of scientific meteorology and he developed the first weather map, publishing “Meteorographica, or methods of mapping the weather” in 1863. Galton also invented many statistical tools such as surveys and questionnaires to help him in his research. He invented the Galton Whistle for evaluating hearing ability. Galton determined that the normal upper limit of human hearing was around 18 kHz. He also established that the ability to hear higher frequencies declined with age. Galton adapted his whistle to test the hearing of various animals. It is still commonly used as a dog whistle. Galton was awarded the Royal Medal in 1876 and the Copley Medal in 1910. He was knighted in 1909. He founded the Galton Laboratory for National Eugenics, and the Galton Eugenics Professorship, later these positions combined into the department of applied statistics at University College, London. He died in January 1911, aged 88 in Greyshott House, Haslemere, Surrey.